“When we shot the 'Love Removal Machine' Video in London in 1987 to save money we also shot a video for 'Lil' Devil' with the same crew and location. Unfortunately the ‘Lil Devil one wasn’t very good and our American record label rejected the video as too low quality so we filmed one whilst we were on a day off while on the road on the Billy Idol tour. I was quite happy though as in the original one I embarrisingly wore a hat, which was the only time I’ve ever worn one in a video. It was a horrible Cowboy hat with a snake on the front and it’s now in a display in Hard Café Las Vegas, and people usually think it belonged to Ian. Anyway we basically took over a whole small town in Indiana, shot in black and white, shot scenes in a drive in, us playing, Ian in a car, me on a motorbike. The hilarious thing though is that I’m faking riding 'cos at the time I could barely ride a motorbike. 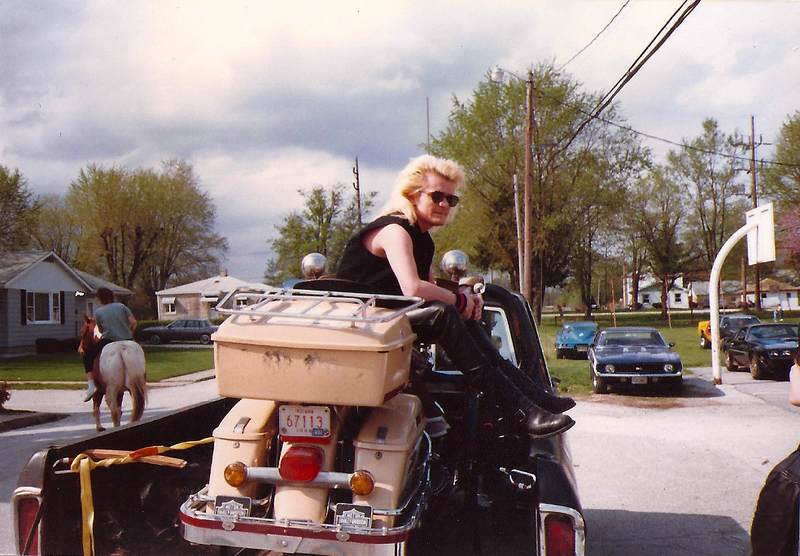 It was a huge old Harley that belonged to somebody and they were worried I’d crash it so they strapped it to the top of a pick up truck and filmed me from the front while they were driving along. So I made it as cheesy as possible by grinning away as it looked like one of those old movies shot with the blue screen and background super-imposed. So this is a snapshot taken from that day filming."